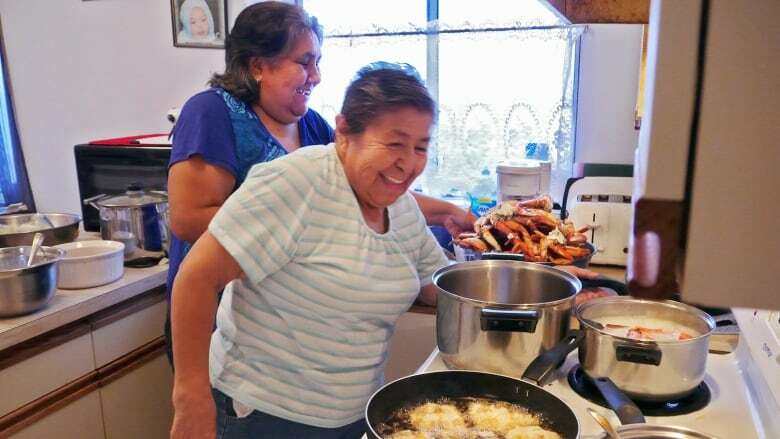 Gale Creek clams have long been an important source of income, sustenance and tradition in the remote home of Heiltsuk First Nation. But now they're gone. 'It's just a clam in Western eyes.' To this family it's so much more. Two generations ago, Stan Larsen walked the shores near Bella Bella, B.C. digging up clams — an important source of income, sustenance and tradition for the Heiltsuk First Nation. Locals call their remote home "the rock." Each mollusk, pulled out from the moist earth, brought Stan closer to buying a gift that was a rarity then: a doll that his young daughter Dora had seen in a catalogue. "He went out digging for clams until he had enough to buy the doll," recounts Dora's daughter, Zoe Hopkins. Today, it's a different story. Now it's the clams, once teeming in the ground, that are the rarer find. In October 13, 2016, a tugboat pushing an empty fuel barge ran aground on the mouth of Gale Creek on B.C. 's central coast. 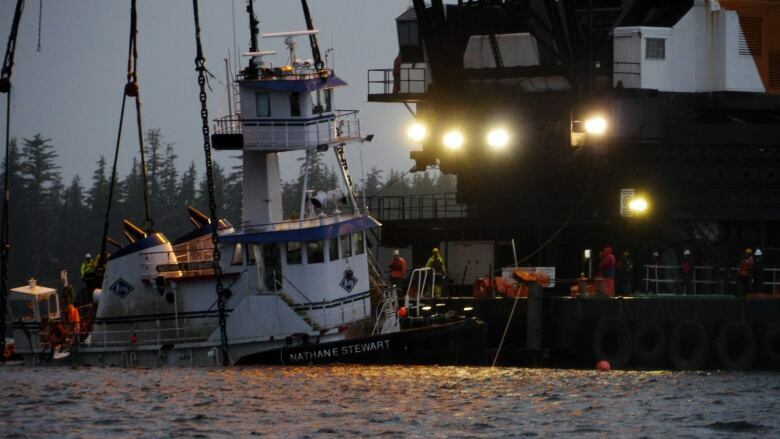 The Nathan E. Stewart sank to bottom of the ocean, leaking tens of thousands of litres of diesel fuel into the waters west of Bella Bella. The sunken vessel sat there until well into November. The mess could be seen, and smelled, for miles. It seeped across key Heiltsuk hunting, fishing and seafood gathering grounds. It swiftly devastated the local clam beds. Hopkins, a documentary filmmaker, captured footage of the aftermath: from recovery efforts to tense community meetings to weary looks around the kitchen table. Her new short documentary Impossible to Contain was shot in 360°, with mobile phones and virtual reality headsets in mind. The seven-minute film hopes to make distant viewers feel closer to the spill, whether looking down at it from a helicopter or cutting through it on a deceptively tranquil boat ride. "I don't expect anyone who wasn't there in real life to feel the intensity," says Hopkins, who says the area smelled like a gas station and the water was covered with a rainbow sheen. The immersive doc comes as close as possible. "I wanted people to have the sensation of standing at the beach." But the filmmaker admits she left certain images out of her documentary — like the constant tears and "big heavy sobs" of elders. "I saw people cry every day," she says, adding that elders and chiefs took to piers and coast guard boats to witness the aftermath. The sight seemed especially hurtful to older generations, her grandfather's peers, who have the deepest connections to the land. She remembers one elder looking out the window just shaking his head. "I didn't want to roll a camera on people's faces." Ultimately the spill shuttered the local clam fishery and cost 50 seasonal workers their jobs — a hard hit for a community of only 1,500. The Heiltsuk say manila clam beds provide income of up to $150,000 per year for the community. The spill also affected sea cucumbers, sea urchins, seagull eggs, prawns, cod, salmon, duck, seal and dozens of other species harvested in the area. "People don't really understand the cultural impact," says Hopkins. "It's just a clam in Western eyes." But in her community, clams are an important part of family and community traditions and one of the foods they enjoy the most. "We even have a clam dance," she says, adding that women and girls crouch down, hide and hiss like clams in a traditional dance shared by many coastal communities. "It's one of the more fun dances." They're the main ingredient of clam fritters and a lighthearted point of debate in her family. "My mom says Nan makes them too big," she laughs. The shuttered clam fishery was "the richest and the closest" place to get clams, says Hopkins. Locals must now rely on frozen preserves or travel much farther afield for the mollusks. Months after the diesel spill, no one knows when and if the Gale Creek clams will return to this part of the environmentally sensitive Great Bear Rainforest. It's hard to document absences. While riding out to the spill site to collect footage, Hopkins got an early sense of how long the repercussions could last. "The man who took us there talked to me about another fuel spill that closed another clam fishery," she says, describing boat operator Ron Martin Sr. as a lovely, soft-spoken man. He quietly pointed out blackened plants on the sides of the creek and with "a very sad face" spoke to her of camping, the life cycle of the clam and living off the sea. The spectre of irreversible damage weighs heavily on Hopkins's community. "They spilled more than 100,000 litres in the water," she says, adding the spill was felt as sharply as the death of a community member. "Everyone is related to the ocean," she says. "Everyone was caught up in this feeling of loss and this feeling of powerlessness." Watch Impossible to Contain, CBC Docs first 360/VR documentary, to learn more about the spill and how it affected the local community. The film is available on YouTube and on the CBC Docs website. For the best viewing experience, watch it on the YouTube app on a mobile phone.